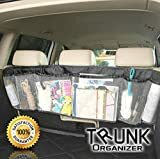 Car Trunk Organizer Backseat Auto Interior Foldable Removable Heavy Duty Storage Mesh Backseat- Multipurpose and Foldable Five Pocket Cargo Net Organizers in Black- Arrange Everything You Need Now! / Car Trunk Organizer Backseat Auto Interior Foldable Removable Heavy Duty Storage Mesh Backseat- Multipurpose and Foldable Five Pocket Cargo Net Organizers in Black- Arrange Everything You Need Now! TIRED OF THE BIG MESS IN YOUR TRUNK OR BACK AREA? Our newly upgraded Car Trunk Organizer is the incredibly useful accessory you need to organize your possessions. Use the 6 roomy pockets to hold pens and notebooks, water bottles, maps and everything else you carry. PRODUCT DIMENSIONS: 44 inch L x 13 inch W . Fits just right behind most seats and in trunks. To install you simply hook the included straps over two headrests. Within seconds you have the ultimate car organizer ready to start making your life easier. CARRY MORE IN YOUR CAR with this ingeniously designed organizer. Makes it easy to carry virtually anything without taking up more floor space. Yes, we recommend this for large trucks, vans, and SUV’s; but it’s also amazingly helpful to create more room in smaller vehicles. GREAT FOR YOUR EMERGENCY KIT! Experts always say to carry flashlights, blankets, extra water and more. These could save your life and your plans if you break down in a remote area or have trouble in bad weather. Also great for organizing sports gear and auto supplies. 100% MONEY BACK GUARANTEE is bound to make this your best no-risk purchase. If you don’t like it for any reason, contact us and we will gladly return your money with no questions asked. Many people are so pleased with this Trunk Organizer they’re buying more for themselves and friends. HURRY AND BUY NOW before our supplies run low. Consider giving this as your next gift to friends, family, and co-workers. AUTO TRUNK ORGANIZER NEWLY UPGRADED. Use this amazing mesh organizer in the trunk or behind the back seat. Now we’re using a far more durable material (1680D) that is an remarkable 3 TIMES STRONGER. Your upgraded car trunk organizer won’t rip or tear. Expect it to last for years! POCKETS GIVE YOU LOTS OF STORAGE SPACE. Six generous, roomy pockets give you all the space you need to stash kid’s toys, groceries, clothing, sports equipment and so much more. Super strong mesh lets you see what is in the pockets. Also lets groceries and other items breath. FITS ALL HEADRESTS using convenient straps that secure your Trunk Organizer. Won’t droop, fall, or fly up. This is designed to be the trouble free organization wizard that makes your life easier and more convenient. REDUCES CAR CLUTTER so you don’t have food, clothing, shoes, and other items flying around in the floor board. Makes your car much more safe by keeping items secured and out of the way. The perfect must-have accessory for any car, truck, SUV, or mini van. 100% MONEY BACK GUARANTEE ensures this is your all-time favorite no-risk purchase. If you don’t like it, we’ll return your money no questions asked. Many people are buying one of these for all their cars and trucks. HURRY AND BUY NOW before our supply runs out. The Trunk Organizer makes the perfect gift for any friend, relative, or co-worker. Need something to help organize the back of your car, pick up or SUV? Tired of the big mess on the back? Searching for the perfect car organizer is not easy. Some are too big too bulky or just too small. This TRUNK ORGANIZER is made to fit perfectly on your back passage seat. There are pockets of various sizes at the outside. These pockets are perfect for pens and notebooks, water bottles, maps, and other whatnot’s. – Storage your baby wipes, clothes, towels, pencils, anything you need! And keep your vehicle mess free! -100% MONEY BACK GUARANTEE. If you are not happy with your purchase, you can return it for a full refund. Wait NO MORE! Go to the top of the page and buy the perfect car accessory NOW, Limited stock available.